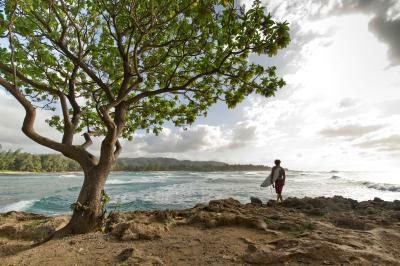 Lock in a great price for Turtle Bay Resort – rated 8.7 by recent guests! Beautiful location. The restaurant staff was extremely friendly. Due to the weather we didn’t stay as long as we planned but overall it was a beautiful place with nice amenities. This location can not be beat! The views and waves are really special. We wanted to give the North Shore a try and the atmosphere is really different than Waikiki. Slower, peaceful, different views. The actual property (not the structure or staff) is ideal. The space and use of the natural views was everything I had hoped for. I could watch the large waves crash in all day. Plus there are lots of walks you can take to see more natural beauty. I also liked our view out our partial ocean view. It was so nice to wake up and see the sun filling the sky while watching the waves. The balcony was large and very relaxing. Rooms were much larger than normal rooms. Lots of space to move about and feel comfortable. Resort did not feel overly crowded. Even though there was lots of people there it felt like there was plenty of room. Overall a great place and I would recommend to those looking for a change from Waikiki. Staff was fantastic, very helpful and friendly. Horseback riding was best part. My kids loved it. Breakfast on 6th floor tasted great though the 'breakfast in the hallway' format was strange. Concierge was very helpful. The location is excellent on the North Shore and the sheltered bay is perfect for kids! Absolutely beautiful. The ocean-view from our room was incredible. Had lots of options for swimming and other activities. 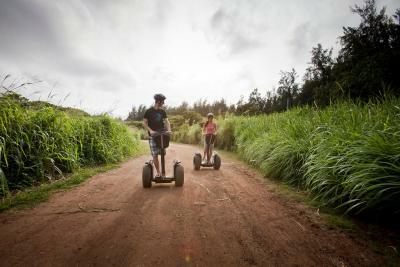 We loved our experience renting Segways riding on the beach and through the woods. The facilities were absolutely beautiful and the view from our balcony was amazing!! The location was stunning and we were able to walk every morning on groomed trails. The location was very nice. The scenery was incredible. Location is amazing- surf school fantastic. Very friendly staff. The view from our room was absolutely breathtaking. 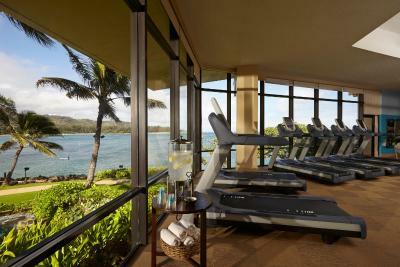 Turtle Bay Resort This rating is a reflection of how the property compares to the industry standard when it comes to price, facilities and services available. It's based on a self-evaluation by the property. Use this rating to help choose your stay! One of our top picks in Kahuku.Located on 5 mi of beachfront on Oahu’s North Shore, Turtle Bay Resort offers 2 championship 18-hole golf courses designed by Arnold Palmer and George Fazio. 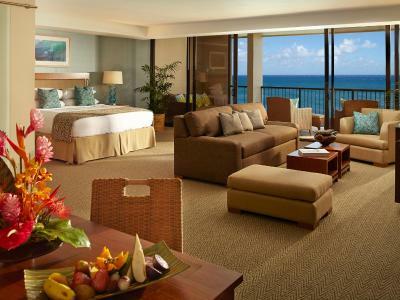 All guest rooms offer ocean views. A TV with cable channels, a refrigerator and a coffee machine are available in each air-conditioned guest room. 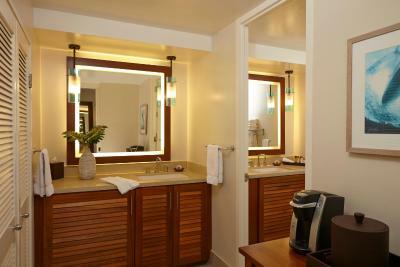 Modern casual Hawaiian décor and subtle-colored linens are provided. 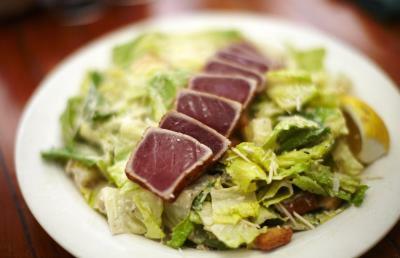 Restaurants include the sandy-floored restaurant, the Roy's Beach House, offering modern Hawaiian cuisine. Local, organic ingredients are featured in the seafood dishes at Pa’akai and the North Shore Kula Grille. The poolside The Point Bar & Grill offers cocktails and light bites. Lei Lei’s Bar & Grill, overlooking the golf course, is open for breakfast, lunch and dinner. The Lobby Lounge features grab-and-go options for breakfast. Surfer, The Bar offers local beers, cocktails and live music on select evenings. 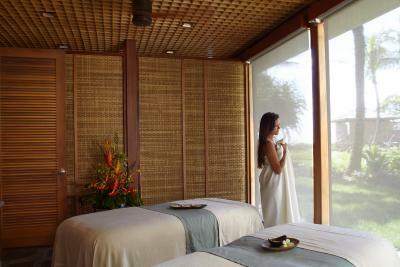 Nalu Kinetic Spa offers massage therapy, body treatments and beauty services. 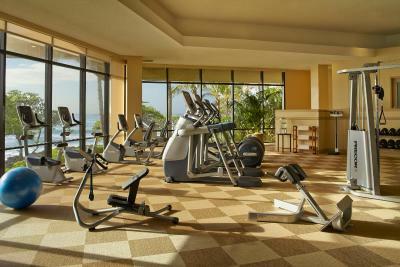 A fitness center features group exercise and yoga classes, and personal trainers are also available. Two hot tubs and a water slide are available for guest recreation. Horseback riding, Segway tours, helicopter tours, snorkeling and stand up paddle boarding, surfing and scuba instruction are located on site. The Polynesian Cultural Center is 4 mi away. 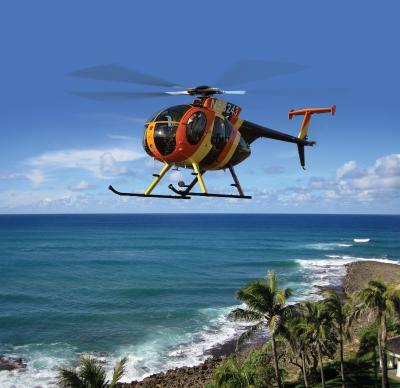 The Honolulu International Airport is 37 mi away from Turtle Bay Resort. 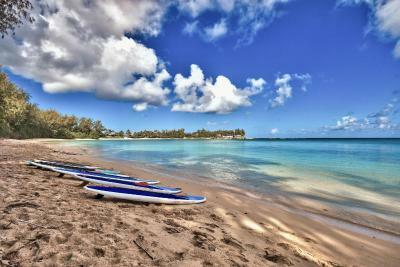 This property also has one of the top-rated locations in Kahuku! Guests are happier about it compared to other properties in the area. This property is also rated for the best value in Kahuku! Guests are getting more for their money when compared to other properties in this city. 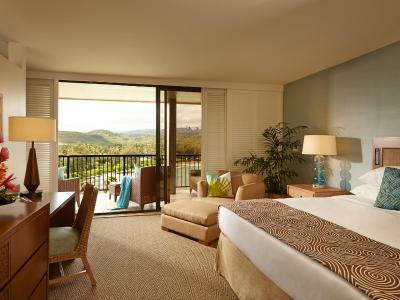 When would you like to stay at Turtle Bay Resort? Ocean, bay and landscaped rooftop garden views are featured. Extras include an en suite with a double vanity and a stone-enclosed shower, mini fridge, and a Keurig coffee machine. Rates are based on double occupancy. Maximum occupancy is 3 guests. Charges apply for additional guests. See hotel policies. 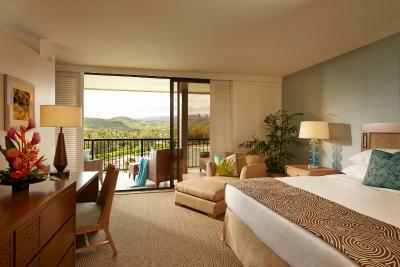 Located on the 2nd level, this room features a view of the ocean, resort, and rooftop garden. Extras include a mini fridge, Keurig coffee machine, and spacious en suite with a double vanity and a walk-in stone shower. Rates are based on double occupancy. Maximum occupancy is 4 guests. Charges apply for additional guests. See hotel policies. Located on floors 2-6, this suite features a private terrace with ocean and bay views. The large bathroom features a soaking tub, a vanity and a spacious walk-in stone shower. Extras include a mini fridge, a Keurig coffee machine and nightly turn-down housekeeping service. This room features ocean and bay views. The bathroom includes a double vanity and a walk-in stone shower. Extras include a small refrigerator and a Keurig coffee machine. Rates are based on double occupancy. Charges apply for additional guests. See hotel policies. 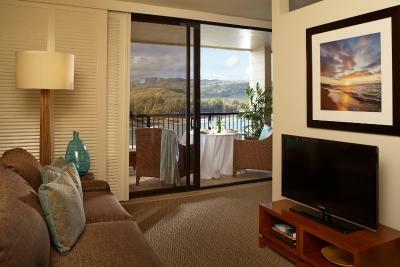 Located on the top floor, this room features a balcony with unobstructed ocean and bay views. The bathroom includes a soaking tub and a walk-in stone shower. Extras include a refrigerator, Keurig coffee machine, and nightly turn-down service. Located on the top floors with expansive ocean and resort views, this guestroom includes access to the Vista Level Enhancements Center where daily North Shore Breakfast Bites are served. Access to a dedicated VIP Concierge and plush robes and towels are available. Queen rooms feature a large walk-in stone shower. Maximum capacity of 4 guests. 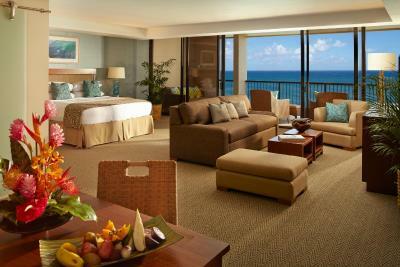 Located at the end of each wing on level 2-6, this suite features a private balcony with ocean and bay views. 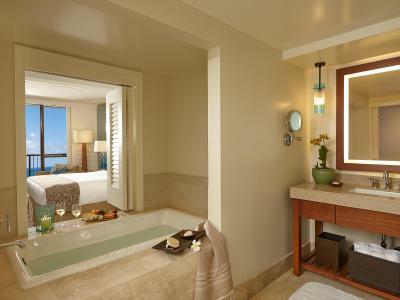 A sitting area with a sofa bed, soaking tub, and a walk-in stone shower are provided. Extras include a mini fridge, a Keurig coffee machine, and nightly turn-down service. Featuring ocean view, this studio suite offers a private Hawaiian-style terrace, fully-equipped kitchen and private bathroom with bathtub and separate shower. Just steps from Bay View Beach, this 3-bedroom, 2-bathroom condo features a gourmet kitchen and large dining area. 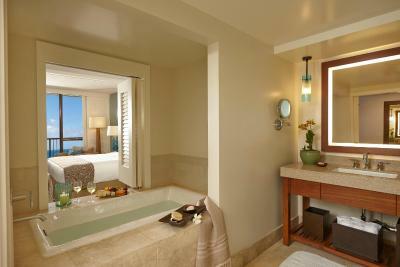 The master suite features a large soaking tub, stone shower and double vanity. Rates are based on 6 guests. A maximum of 8 guests can stay in this room. Please refer to the policies for fees that will apply for additional guests. Rates are based on 8 guests. Maximum occupancy is 10 guests. Charges apply for additional guests. See hotel policies. Situated along the west shores of Turtle Bay, this designer cottage features polished Brazilian walnut floors and 15-foot high ceilings. The marble bathroom features a soaking tub and freestanding glass shower. A private furnished terrace is provided. This double room has cable TV and sea view. 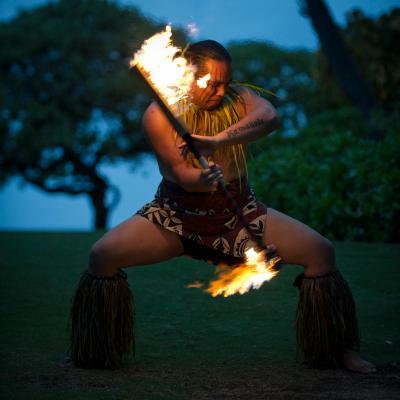 House Rules Turtle Bay Resort takes special requests – add in the next step! All older children or adults are charged USD 50 per person per night when using existing beds. Turtle Bay Resort accepts these cards and reserves the right to temporarily hold an amount prior to arrival. Air mattress may be available upon request at the front desk for an additional fee. Contact the property for more details. Pets are allowed but with a nonrefundable pet deposit. Pets need to be 35lbs or less and are not allowed in our Villas or Cottages. A smoking cleaning fee of 300 USD per sleeping space will be charged for any smoking in guest rooms. Self-Parking is 15 USD per day, and Valet Parking is 20 USD per day, plus 4.712% tax. Resort Fee is 46 USD per day, plus 4.712% tax for all hotel rooms and cottages. Resort Service Fee is $75 USD per day plus 4.712% tax for all villas (1 bedroom studio, 3 bedroom and 4 bedroom). No fan in bathroom. Balcony with many rooms too small to enjoy. No newspaper to read in lobby. Pool chairs use system needs better monitoring as people save areas when first open and don't use them until much later in day so not available for others. Need more umbrellas by pool and on beach to avoid over-sunning. Several tiles missing and rest had scale build-up in main pool. Need to have adult only seating areas in restaurants away from kids. Kids regularly in the adults only hot tub. Sliding glass door to balcony very hard to open and close (need regular maintenance). Great staff. Nice gym facility. Plenty of good food choices. Perfect ocean water cove on property. Very large guest room. Facilities packed with locals all weekend. Cannot get a pool chair and pool is packed. Stores and cafes miserably low on food supplies. Roy’s food is always outstanding, but the service was so poor we got up and left. I have mixed feelings about the property. Since they are the only ones around and it is the North Shore vibe I can understand why the quality is a bit below par but at the same time some of their offerings are top notch. The property is beautiful while the structures are a bit worn and the staff a bit jaded. We did have many great interactions with staff but too many of them seemed less than helpful. We had a problem with a toilet in one of our rooms for no reason. The maintenance person came and fixed it but I suspect it is just old or troublesome plumbing. Not enough lounge chairs at pool for all the guests. Thought that a resort with this reputation would have had a larger pool or a second major pool to support the number of guests, felt a bit cramped on pool deck. Surf instructers were great, food options were solid, location was fantastic. Being the only hotel in the area, they really gauge you price wise with a "if you don't like it go somewhere else and we know there's nowhere else" attitude. Self parking, a 5 minute walk from the hotel SHOULD be free with the huge space they have but they charge 40 dollars a night!! Again, because they know everyone going there drives. Then there's the expensive resort taxes everywhere in Hawaii that SHOULD be listed along with taxes on the booking.com site so people see for what exactly what they're paying. 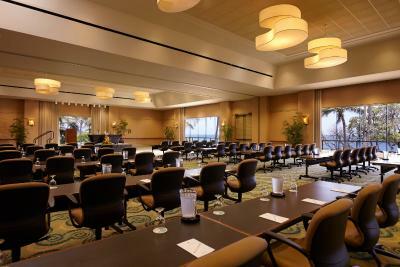 Great resort feel with lots of dining, leisure, and adventure activities to choose from. The staff is great and the views are stunning. Shower in bathroom had a musty smell. (Rm 549). Why charge guests to rent the beach chairs? The snorkel is free but not the chairs? Parking is a mess and unless you pay extra to valet park, you are walking a long way and competing with local beach-goers for spots (who park for free, while the hotel charges you $15/day). Chairs on the beach cost extra and shade costs even more. 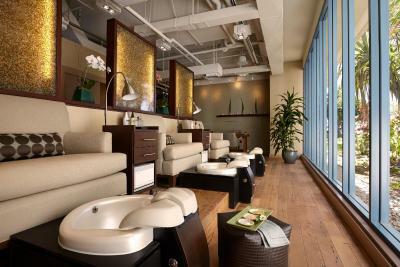 The amenities are nice, but there is a constant feeling you are being nickel-and-dimed. WiFi in our room worked <20% of the time. Can’t speak to other restaurants, but dinner service at the pool bar restaurant was very slow, taking over an hour from when we ordered until food arrived. Overall, this is an unmatched location offering beautiful views and plush accommodations. However, we were generally disappointed that service was less that what we’re accustomed to from much less expensive resorts and the hefty, mandatory daily resort fee covers a very limited number of amenities, creating a prevailing feeling we were being nickel-and-dimed. The view from our 6th floor lanai was absolutely amazing, loved listening to the sounds of the ocean. Our room was nicely furnished and very clean, and the staff were lovely. Price and variants of food. It was a nice place.. but over priced for what your getting. Food was expensive. The gokd club food was better value, and a real nice place to eat.